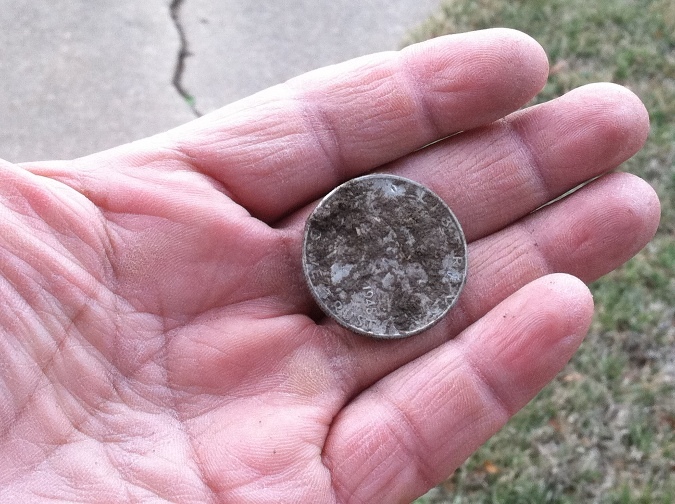 For my lunch hour hunt today, I returned to the site where I found the two Mercury dimes yesterday. A couple of swings into the hunt I got a broken signal that was persistent enough that I investigated further. After listening to it carefully, I deemed it diggable due to a certain silk in the tone. My Deus was indicating a deep target with barely a pip in the horseshoe (if you hunt with a Deus you know what this means). So I dug a 7 inch hole and nothing. I dug one more inch and I got a hit with the Garrett pinpointer. I dug 9 inches and with the entire pinpointer in the hole, I was still getting a hit. Finally, I dug one more scoopful of dirt and out came out this dirt ball with a large, beautiful reeded edge sticking out of it. I was shocked because by the time I had dug the 9 inch hole I was convinced this was a chunk of rusted iron. 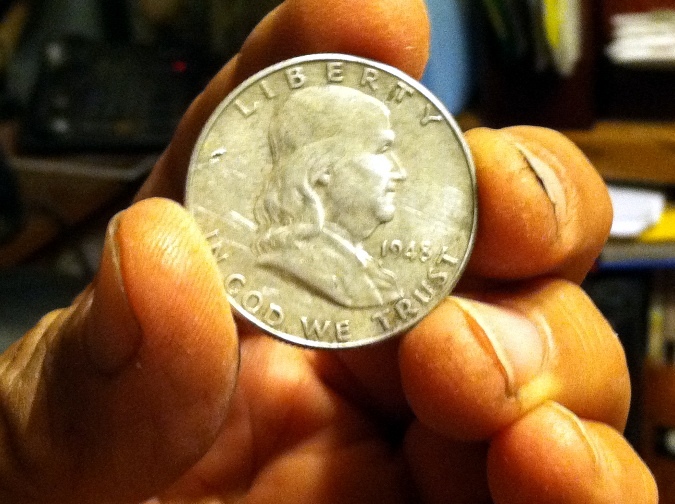 1943 D. The last Walker I got was back in December of 2012. This is only my third Walker ever. All three of the Walkers were found in the same general area. The very first Walker I found, I found with my Ace250 about 50 yards from this one. 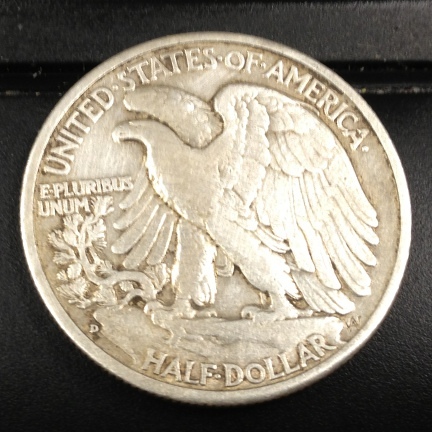 I am 14 silver coins short for the year so I need to hustle and find more! I had planned on going to my silver park for lunch but due to unforeseen circumstances, me and my XP Deus metal detector had to go somewhere closer. This turn of events was fortuitous for me. 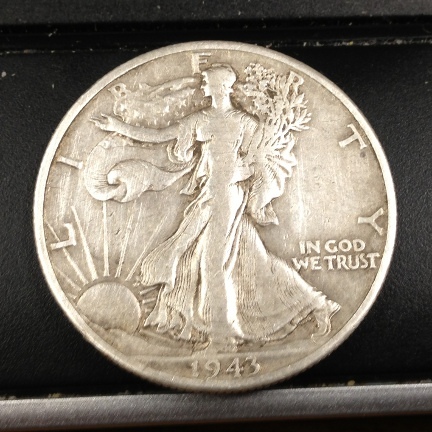 Yep my friends, you are looking at a nice 1945 Walking Liberty half dollar coin. I kick myself for not having been more careful. This is only my second Walker ever and the first with the Deus. Now I know what kind of signal they give. So it seems I am on a silver streak which is cool because Saturday I am hunting a pre-1900 church site, now a farm field planted with winter wheat. What this means is that any coins found therein are guaranteed to be old. Come on Seated!!! 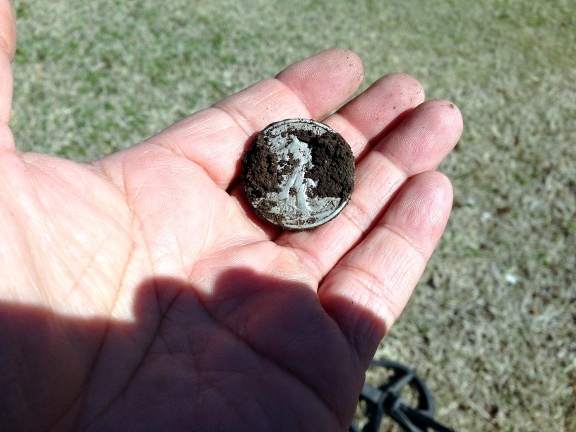 I went to McAdams park this morning to finish hunting the spot where I found the Mercury dime yesterday. Fifteen minutes or so into the hunt I got a signal that sounded right but the VDI on the AT Pro jumped from 82 to 95 and every number in between. Thinking it may be a bottle cap I cut and flipped the plug. The Garrett Propointer indicated that the target was on the side of the hole and about four or five inches deep. I stuck my Lesche to retrieve and this huge silver disc jumps out. Man, was I grinning! 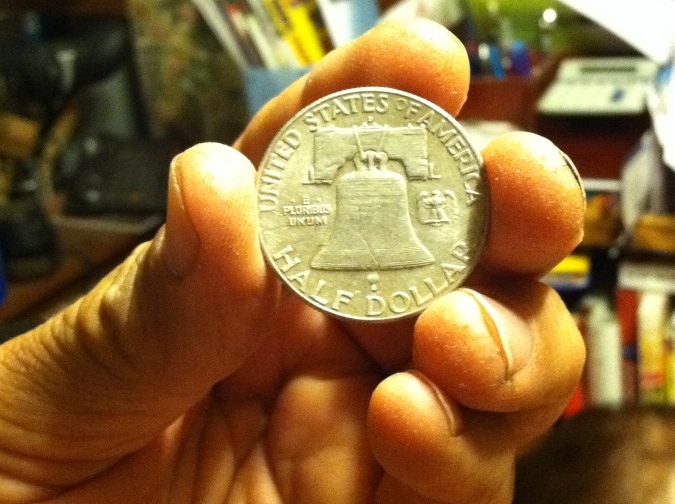 Although the coin was covered with dirt, I could see the year; 1948, and I knew right away I had a Ben Franklin half. This is my first Ben Franklin and coin #31 for the year.